A culmination of what began as (and to a certain effect, remains) a meditative, unconscious process and a vested interest in the culture and history of tribal practices in Afghanistan, where in ancient carpet weaving the reminder that god is in the detail can be compelling. Regardless, in ancient carpet weaving, contemporary art, and in all things we undertake, we would do well not to take shortcuts. These digitally-produced carpets, painstakingly created in Microsoft Word with millions of individual manual keystrokes, can be seen as a surprising and profound dichotomy between East and West. In contemplating this work, a dialogue is generated using a voice that is in itself a contradiction – a compelling combination of both visual and digital language. Viewers are invited to peer closer at the minutiae of the characters that comprise the vast fields of colour. Toronto-based Afghan-Canadian artist Shaheer Zazai works in the mediums of painting and digital media. His practice currently focuses on exploring and investigating the development of cultural identity in present geopolitical climates and diasporas. Zazai received a BFA from OCAD University in 2011, and was the OCAD University Digital Painting Atelier Artist-in-Residence in 2015 for the production of his first Digital Carpet. A recipient of a Canadian Ontario Arts Council grant, Zazai has since had solo and group exhibitions such as those at the Art Gallery of Mississauga, Hazelton Lanes Art Festival and Project Gallery. We would like to acknowledge funding support for this exhibition from the Ontario Arts Council, an agency of the Government of Ontario. 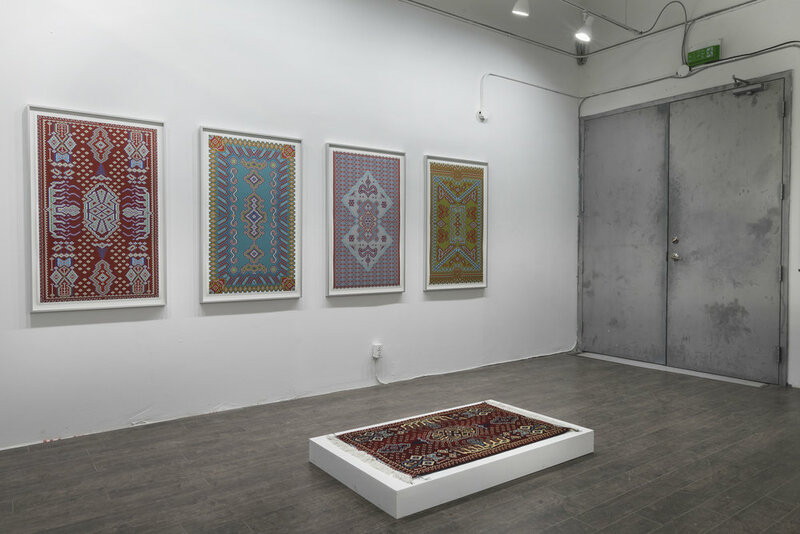 Shaheer Zazai has been creating digital carpets for several years; the vast body of work is a culmination of what began as (and to a certain effect, remains) a meditative, unconscious process and a vested interest in the culture and history of tribal practises in Afghanistan. These digitally-produced carpets, painstakingly created in Microsoft Word with millions of individual manual keystrokes, can be seen as a surprising and profound dichotomy between East and West-- or to use dated but relevant terminology, the occident and the orient. The investigation of Orientalism as an academic exercise has been vastly contributed to by theorists such as Edward Said and Michel Foucault, with texts that have underscored contemporary post-colonial literary and art practises. In Zazai’s body of work, the conversation continues using a voice that is in itself a contradiction-- a compelling combination of both visual and digital language. If we distil the polarity between the east and west very simply into “old” and “new”, respectively, then we can easily see what is old and what is new in Zazai’s work: Microsoft Word is new, shiny, relatable-- a program created in the west for productivity and efficiency. The patterns the artist generates with this modern technology, however, hearken to tribal Afghani carpet-weaving practises that are thousands of years old, steeped in folkloric imagery and technique that has been passed down for an insurmountable amount of generations. Born in the east and entering adulthood in the west, Zazai has not only in a visually-captivating and electric way written his own personal history and mythology (with a complete lack of interest in self-consciously trying to fit into the western art-historical canon) but unintentionally, his body of work also opens up an uncomfortable dialogue. On the note of moderation and humility, also largely evocative in Zazai’s carpets is the call for patience and meditative intentionality, exuded without a trace of didacticism. The artist thrives within limitations, choosing to let his access to colours and character space within a Word document guide and navigate his unplanned patterns; metaphorically, much like a patient tribal carpet maker would be limited in their colour use and resources. In the western world, though there is a definite slow resurgence for the appreciation of the handmade, we have for generations forsook craftsmanship for a mere simulation of it: factory-produced, preservative-filled bread over a hand-kneaded loaf from a slightly more expensive bakery or particle board furniture over something hand-built by a tradesperson, for example. As viewers of Zazai’s digital carpets are invited to peer closer at the minutiae of the characters that comprise the vast fields of colour, perhaps what is ultimately most compelling about this work is the reminder that god is in the detail, as it were: in ancient carpet weaving, in contemporary art, and in all things we undertake, we would do well not to take shortcuts. (1) Reed, Nelson. “Tribal Rugs: Weaving Modernity into Afghanistan.” The Yale Review of International Studies RSS, Feb. 2016, yris.yira.org/essays/1699. Accompanying accessible Limited Edition - ‘ED003: Here Now Back Then’ may be found here. Acquisition & details of Shaheer’s Artworks from this exhibition may be found on our Projects page here.